We rented this wonderful house and it was perfect, my son was getting married and we wanted a property big enough to provide good accommodation for two families. What a ball we had the property is equipt with everything you need and is situated in St Martin which is a super place to stay for all ages. Beautifully decorated in traditional French style each room was individual and we spent our mornings having breakfast outside in the courtyard behind the property which is private and leads off the lounge area of the property. the kitchen is so well equipt and you want for nothing. We will be back for a reunion at some point and will certainly book this property again. Thank you so much Violaine for letting us have your wonderful home for our special occasion. The house is beautifully decorated, lovely rooms, garden patio and the top floor felt like a designer hotel room with great terrace for pre-dinner drinks. My husband, 3 month baby and I really enjoyed our stay here. The ground floor has fantastic layout for groups of friends/family. Amazing location right in the heart of the town so it allows you to have options to stay in st martin or travel around. From the outside, you wont believe how big the house is and spacious the rooms are. The owner (Violaine) was very friendly, helpful and we look forward to returning again. 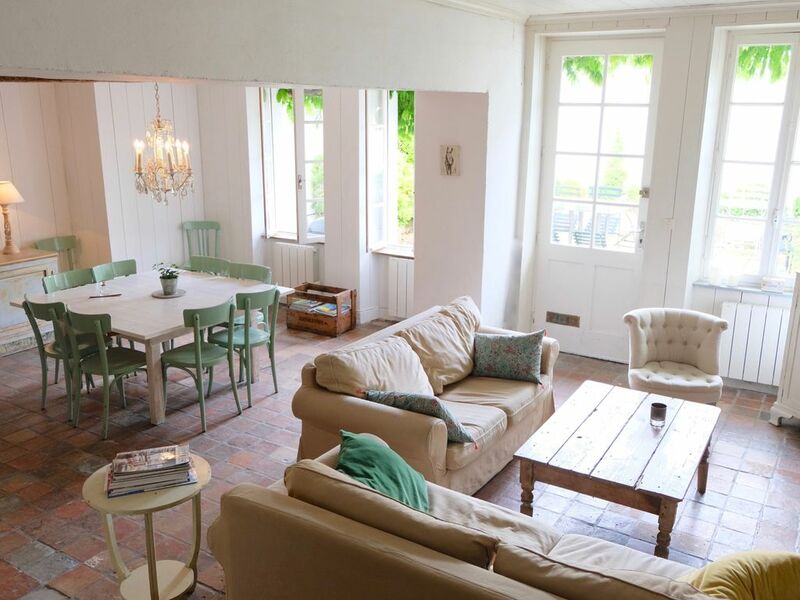 "We had a wonderful stay in this beautiful house - the location is perfect, just a few moments from the harbour in St Martin with its restaurants, bars and shops, and the house itself is beautiful and extremely stylish. There is lots of space, and the courtyard and roof terrace (with lovely rooftop views) mean that even though you are right in the centre of town, you feel that you have plenty of room to relax. The house is equipped with everything practical you need for a comfortable stay, and is extremely stylishly decorated - it''s a really charming place. Very clean, very quiet when we visited in May, with a very helpful owner who looked after us very well, and in a really fabulous location, we would love to stay there again." "We had a wonderful holiday in this beautiful property which is so well located in the centre of St Martin. The house is brimming with charm and shabby chic. We loved it. All really clean and well equipped and the owner made everything so easy for us. We will be back!!" "We stayed at this property in april 08. it is wonderful in terms of accommodation, location and style. The house is centrally situated in st martin beside all amenities yet noise is not a problem. the rooms are very spacious and the quality of furnishings and equipment is the highest standard and very clean. the court is small and quite shaded, I put this in more as an observation than a criticism. in my opinion a faultless rental." "My wife Robin and I found Mme. A's home to be one of the most charming and wonderful vacation homes that we have rented. We found the location particularly convenient to restaurants, shops, markets, and tourist locations in the city. Nights were particularly peaceful. The house was exceptionally clean and had all of the amenities that any traveler could desire. We hope to rent this house again on our next stay in France."